Dà Hóng Páo (大红袍) is an important Wuyi oolong tea. It’s often referred to as the king of teas and there are many legends surrounding it’s name. The tea became famous in Ming times, but dates back to the Song Dynasty, and is still venerated to this day for its excellent quality. It originally grew on Heavenly Mind Cliff, where there was a large monastery. The monks cultivated the tea growing in a rocky crevice moistened by a spring; but picking it was so laborious on account of the height of the trees that the output was tiny and reserved exclusively for the Emporer’s personal use. 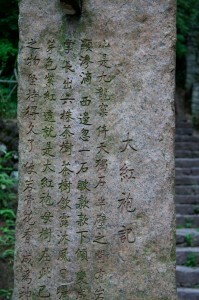 According to one legend, an important Ming official was sent to supervise the picking. He removed his embroidered red robe and hung it on a bush so as not to be hampered while climbing to the lofty branches, thus giving the name big red robe. Another legend has it that due to the inaccessibility of the plants, the monks could only harvest leaves that had fallen naturally. They then trained monkeys tied to ropes to go pick the tea for them. The monkeys wore red robes in the Emperor’s honour, and seen from a distance the trees seemed to be covered with red blossom. Yet another legend states that the mother of a Ming Dynasty emperor was cured of an illness by tea made from these bushes. The Emperor then sent great red robes to clothe the four bushes in order to honour their greatness. Some stories say that during winter the bushes were clothed in red robes to shield them from the cold. What we know for sure is that the edge of the young shoots of the Da hong Pao plants are tinged with red. 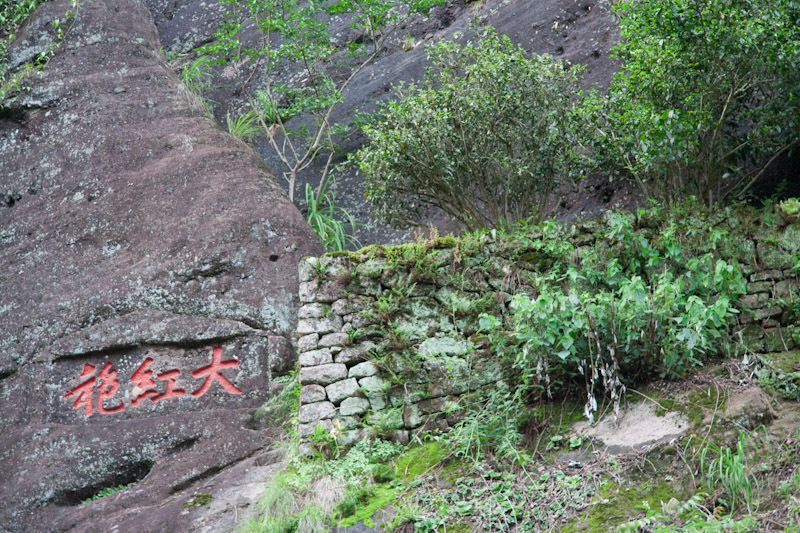 Whichever legend rings true, six of these bushes still grow today on Mount Wuyi and are greatly venerated. At one point less than 1 kg was harvested from these plants each year. Currently these bushes are only picked by an 80 year old woman. However, she has not picked any for the last 6 years. The bushes have become thin and straggly and have been allowed to rest and recover. If you ever travel to the spectacular Wuyi Mountains do take the time to visit the Da Hong Pao area and take in the natural splendour and magic of the place. There is also a spectacular show in town, created by the coreographer of the Beijing Olympics opening and closing ceremonies and film maker Zhang Yimou. In our shop we have 5 Da Hong Pao oolongs of different grades and qualities – from the everyday tea to the most exquisite wild Da Hong Pao.